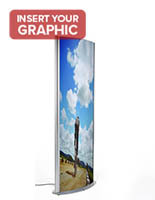 Snap Open Frame: This snap poster frame, poster display is perfect for any high-traffic areas. 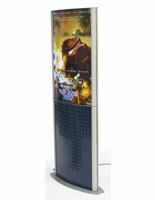 Illuminated Floor Stand 27" x 67"
Don't just display your posters - display them with style! 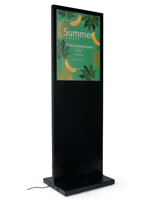 The poster holder display is a stylish alternative to conventional poster holders with its curved display and backlit illumination. The poster holder display, also known as a poster display sign frame is freestanding and is very well suited as a sign holder for high traffic areas such as hotel lobbies, movie theaters, and shopping malls. 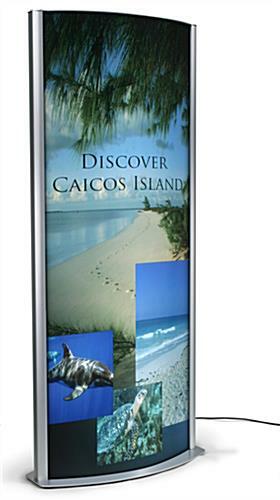 The poster holder display accommodates most 27" x 67" posters. For maximum illumination of sign holders, it is recommended that posters be printed on transparent or semi-transparent film such as Duratrans. The poster holder display consists of a high quality anodized aluminum poster frame along with an accompanying satin metal base. The base is weighted to prevent the sign holder display from tipping over. To achieve the curved sign holder display, two sheets of sturdy PVC are inserted into special grooves along the sides of the sign holder. 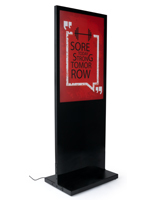 When fully inserted, these sheets bow outward thereby generating a convex poster frame stand. Poster holder graphics are protected by a full-length transparent Lexan film, which affixes to the sign holder on one side with adhesive and the other by magnet. 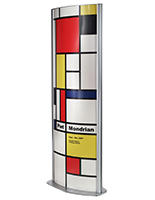 The magnetic strip allows you to open the poster display sign frame just as you would open a door, making the poster change out process quick and easy. 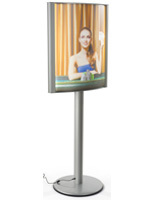 The poster holder display, which is a curved sign holder also features backlit illumination. The unit comes standard with one 59" T8 fluorescent bulb that is inserted between the PVC sheets and into the bulb holder upon assembly. This single bulb is sufficiently bright and provides ample illumination to both sides of the poster holder display. The unit also includes a 24 ft. power cord that is compatible with any standard 3-prong electrical outlet.